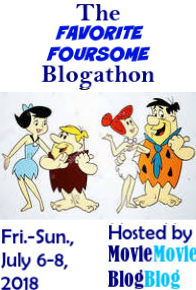 This post is part of The William Wellman Blogathon, hosted by Liz at Now Voyaging. Find the rest of the posts for this event HERE! The general lack of women in most Western movies. Sure, there would be the rancher’s wife, or the schoolmarm, or the dance hall girl (when I got older, I would learn they were actually prostitutes). But . . . it was pretty rare that women got a substantial role in a Western, which really bummed me out. Over time, I was happy to find some exceptions to the rule. Recently, I reviewed one of my favorites: The Furies, directed by Anthony Mann, which stars Barbara Stanwyck. Three more of my favorites just happen to be helmed by William Wellman: Yellow Sky, The Great Man’s Lady, and Westward the Women. 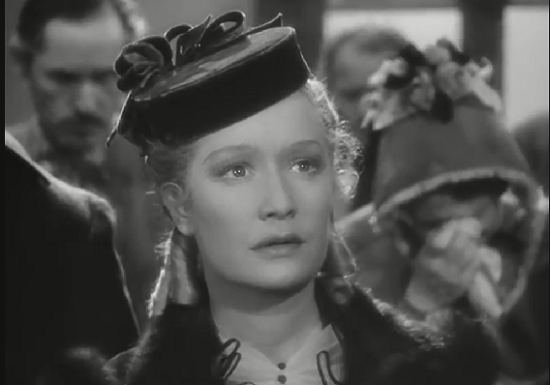 This post is part of the Miriam Hopkins Blogathon, hosted by Silver Screenings and A Small Press Life/Font & Fock. Click HERE for a list of all participants. SPOILERS FOLLOW FOR VIRGINIA CITY. When this blogathon was announced, people jumped in right away and grabbed up Miriam Hopkins’ best-known films. Even though the rules of the event said duplicates were O.K., I wanted to pick a film a bit outside the box. When I looked up the 1940 Western Virginia City, I found out Miriam’s co-stars were Errol Flynn and Randolph Scott, and the movie was directed by Michael Curtiz. As a huge fan of Westerns all my life, I couldn’t believe this one had never found its way onto my radar. So I chose it as my topic. I was a little concerned, though. With two power-house male stars, I was afraid Miriam was consigned to the role of The Girl the Men Fight Over, with a minimal impact on the film’s story. I’m happy to report that’s not the case at all. 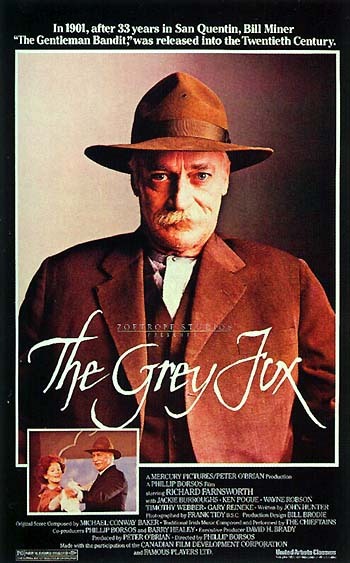 When Kristina and Ruth first announced a blogathon devoted to Canadian film, my initial thought was “The Grey Fox.” This revisionist Western, starring Richard Farnsworth and based on the real-life outlaw Bill Miner, is one of my favorites of the genre.